There’s something to be said about the magic and wonder of childhood. When I was really little there were certain things I gravitated toward, some of which my mom has the credit of opening my eyes to like Superman, Spider-Man and Star Wars. Then there’s other things you discover for yourself. Masters of the Universe was one of those things for me. While I don’t remember every detail about my geekdom for MOTU, I do remember that He-Man was one of the first toys my mom let me get because I asked. I remember the packaging, the logo, the figures themselves being something to spark my imagination. I’d stare at the artwork on packages like Castle Grayskull, Battle Cat and Point Dread and think of the world of Eternia, the battles fought there, the mysteries laying in wait just behind the drawbridge of Castle Grayskull, and the way that science and sorcery went hand in hand to aid in these epic dreams and imaginings. I do remember when the Filmation cartoon, He-Man and the Masters of the Universe, hit in the early 80s. I was in kindergarten and when my mom picked me up that afternoon, I ran home so quickly because I didn’t want to miss a second of my favorite fantasy action hero in full color glory on the family TV. From the opening moments of the title card showing up on the screen to that awe inspiring transformation of Prince Adam into He-Man, to say I was hooked would be a grave understatement. To this day I still love the theme song (and honestly if I’m doing something that’s a challenge I still hear the song in the back of my mind, ask my neighbor the day he was moving out of his old apartment and I was the one manhandling his couch into the dumpster) but the moment that brings me back to being a child again is the moment when Prince Adam needs to raise the power sword to become He-Man. Yes, I’m aware that that moment is very similar to Captain Marvel’s SHAZAM! transformation. But never did Captain Marvel have that badass theme song, nor did he transform a fraidy cat into Battle Cat to ride into the fray and take care of business. When I was a child the planet of Eternia was a place for my imagination to run wild, which is why the adult version of me decided to take a little trip back there. As a child I couldn’t understand why adults lose track of what made them happy when they were kids. But once life’s tsunamis can crash into you as you grow up and your parents aren’t there to buffer the storms like when you were little, I started to see how it’s easy to lose track of those childhood favorites, focusing on reality, focusing on the task at hand. Even though I’m going to be becoming a husband and I’ve already become a father, I’ve got too much Peter Pan in me to make me not want to completely grow up no matter what. That’s why this trip to Eternia was important for me. 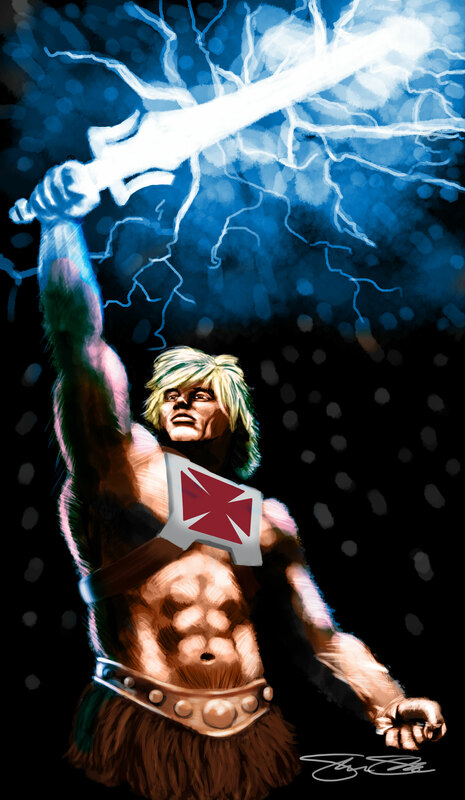 He-Man and Masters of the Universe are owned by Mattel. Authentic Productions Entertainment and Shawn Skvarna do NOT own these properties, though Shawn Skvarna wishes he did. All rights reserved. Shawn Skvarna is the cover artist for the non-fiction book Down with the Thickness: Viewing the World From a Fat Guy’s Perspective, the sci-fi detective novel You Only Die Twice, and the fantasy novel The Chosen: Rebirthing Part 1- all available now in digital and paperback formats. Sample chapters and more information about these books can be found here.